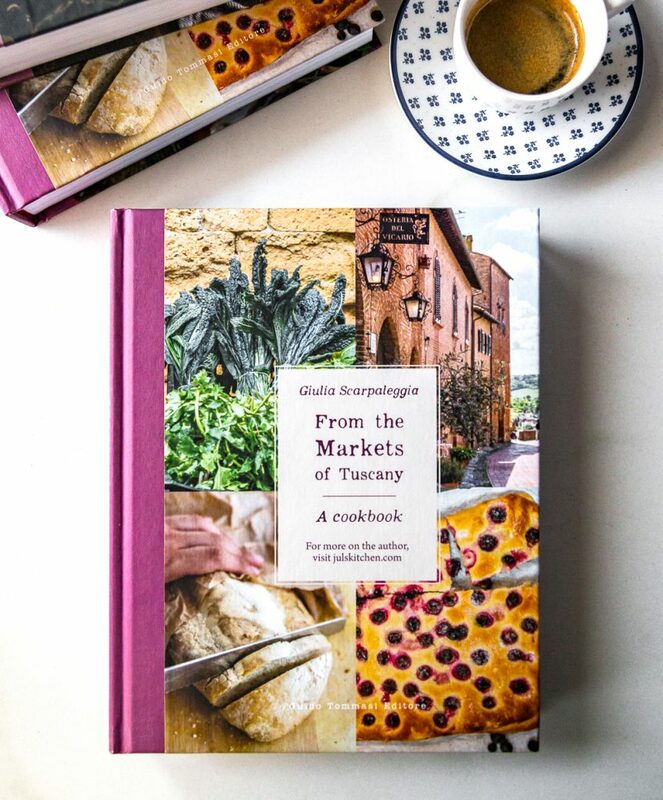 In the last weeks I’ve been working on quite a number of recipes for a new project, a new book which will be published in a few months, just in Italy, but I’ll tell you more about this soon. This meant making cakes, cookies, rice, vegetables, meat and fish dishes in every spare moment, with ingredients which sometimes were out of season. I cooked till I was almost sleeping standing on my feet to be able to complete all the required pictures. But I’m done, now I’m ready to begin the writing phase. I made bitter orange marmalade, pear jam, lemon marmalade, limoncello, lemon salt and preserved lemons. I began again my baking course and there, in a few hours in the evening, we made ninety rosette, Italian light buns, and five trays of savory croissants. I recently read on the web a few articles on decluttering and I started to lighten up the library, then the kitchen, and now I have extended my cleansing process to the rest of the house. We also decided it was time to live together, so he moved in, here in the countryside. I turned a Florentine guy into a country man, or at least, I’m trying to. So in the recent weeks we have also made a move, and right now we are trying to squeeze two kitchens, two wardrobes, two bookshelves and two bathrooms into one single apartment. At the moment there are still boxes piled up in the attic and along the stairs, but the house has already changed its atmosphere, it’s warmer and cozier. We also decided to paint the kitchen: we are bringing all the furnitures from a cherry wood to an antique white. I can already imagine the next video recipes made in a brighter kitchen. It has been a week since I started laying the table with two mugs at breakfast, one week since the slippers at the bottom of the bed doubled, the coziest place for Noa to sleep at night. What most struck me has been the naturalness of every gesture and every new habit. After all, we’ve been living here and there, driving up and down on the motorway for so long, we just stopped in one place. And now we call it home. There’s one aspect, though, which is still unusual and unnatural for me: food shopping and menu planning. Let’s start from here. What happens when a supply maniac engineer’s kitchen blends into the kitchen of a foodblogger which is passionate about seeds, legumes and cereals? An implosion. We mutually decided to limit the upcoming visits to the market to fruit and vegetables until we manage to empty the pantry. At this rate, the next time we’ll shop at the supermarket will be already summer. On the menu planning I still have a lot to learn. I mean, I’ve been a foodblogger for more than six years now, I dream about menus during the day and at night while I sleep, I read magazines and cookbooks, yet I panic when I have to arrange three meals a day. I blame my usual way to decide what to cook: two recipes for the blog, three for that magazine, ten for a book. All the dishes are usually not linked by a common thread, but decided according on what I needed to deliver. Now I have to learn to rationalize leftovers, reduce waste, vary proteins and grains. Add also making bread and a cake for breakfast. I am already excited, it’s like shifting from playing with dolls and children plastic saucepans to a real set of cast iron pots and pans. There will be a pretty busy schedule here on the blog. Luckily, there are eggs and leftovers, which solve every meal. A panino with an yellow and spongy frittata has always been my boxed lunch during school trips and the scorching August when I was harvesting, my first job as a grown up. 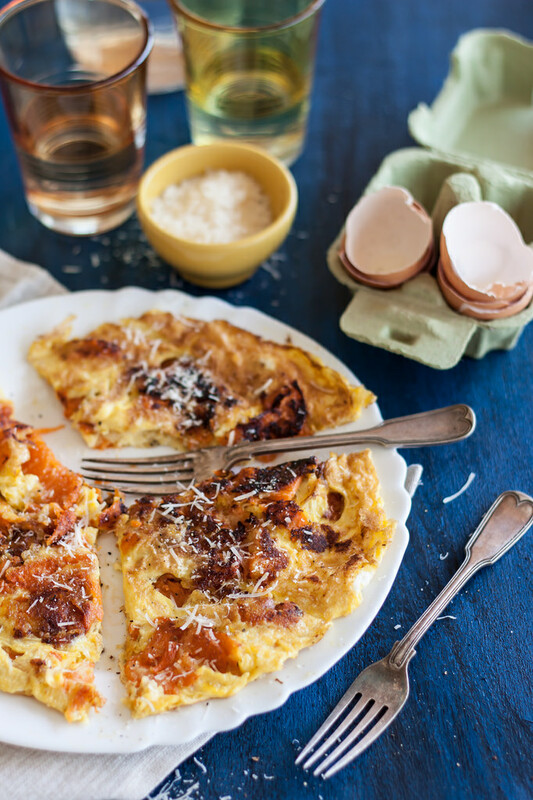 The Tuscan frittata is a simple omelet made with a few eggs beaten with a fork and a drop of olive oil, which softens the bread and almost blends into the crumb. I would unwrap my sandwich gently, as not to miss a single crumb. 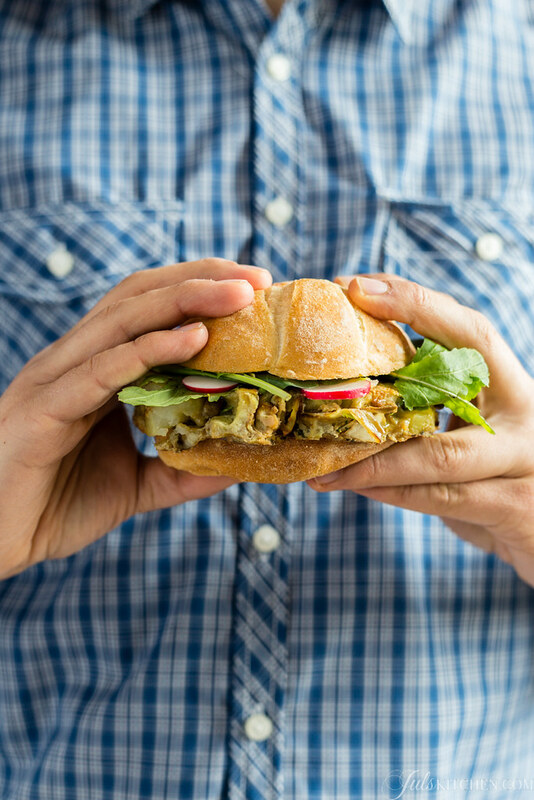 In these days of moving and recipe testing a panino with an omelet seemed the perfect solution to use leftover boiled potatoes, to finish the artichokes that were withering on the counter and to make something quick and comforting. 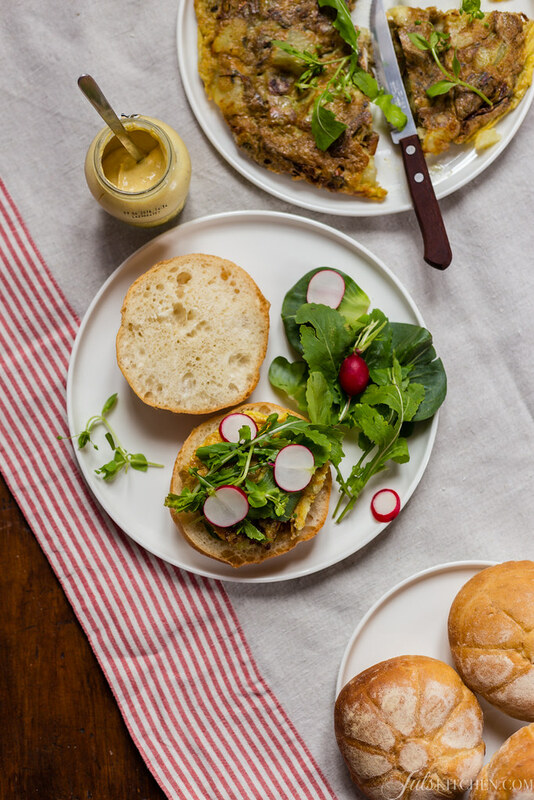 The artichoke and potato frittata can be served alone with a mixed salad as a quiet lunch, but put it on a sandwich – a rosetta taken away from the course – with arugula, radicchio and radishes and a thin spread of strong mustard: it becomes something special and makes you feel outside in a field even if you are in a country kitchen suddenly overcrowded with boxes, ideas and smiles. Clean the artichokes, remove the tough outer leaves, rub them with lemon and cut them into eight wedges. As you clean the artichokes put them in a bowl with the lemon juice and the two halves of lemon to prevent them from blackening. Drain them in a colander and dry them with some kitchen paper. In a pan heat over medium heat a few tablespoons of olive oil with two crushed cloves of garlic. When the garlic turns golden add the artichokes and sautée them on medium heat with a few sprigs of fresh oregano. Add the pancetta cut into strips. 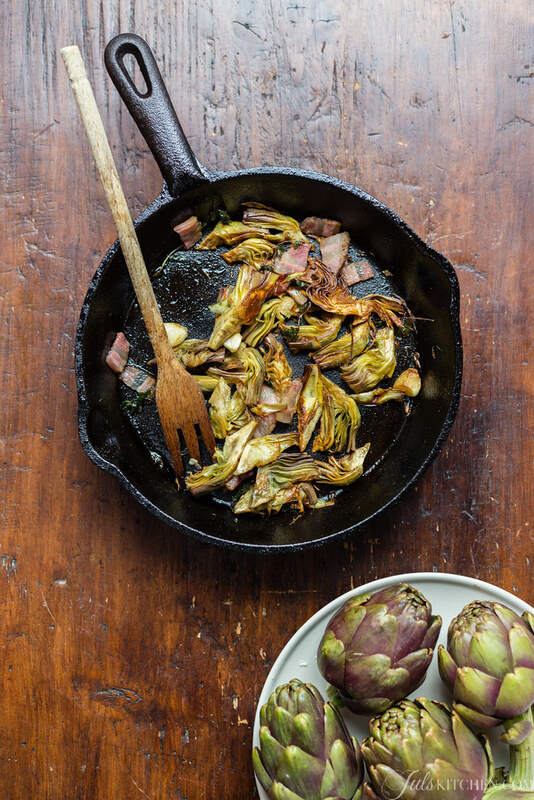 Cook the artichokes for about ten minutes, turning them often with a wooden spoon. When they are tender transfer them on a plate. In the same pan, add a tablespoon of olive oil and brown the sliced ​​potatoes for a few minutes, then remove them and add them to the artichokes. Whisk the eggs with a pinch of salt and some ground black pepper. 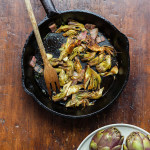 Pour again a tablespoon of olive oil into the pan to grease the bottom, add the potatoes and the artichokes. Pour the eggs and cook them over medium heat until set on one side, turn the frittata with the help of a plate or a lid and wait until the eggs are set also on the other side. It looks so very tasty — and how nice of you to do some additional cooking even after the cooking marathon for your new book. 🙂 I agree as far as decluttering. I love to collect cookbooks — especially on bread baking but there are some that I haven’t used in years — time to retire them so that I can make room for other cookbooks that I want. My hubby and I have come to an arrangement once he retired — it was really difficult sharing “my”kitchen. But he prepares breakfast and together lunch is usually leftovers and dinner is worked out together. If I’m working on a certain project for my blog he’ll take over in other areas. We have been married for 45 years so we’ve had lots of practice but I’m sure you’ll also find a way. Looking forward to your cookbook. I’ve really enjoyed following your blog and noticing how you and your blog have evolved. Your recipes are honest and wonderful, Congratulations on your book, I can’t wait for it to be launched and hopefully it will be available to people outside of Italy. One day, I promise myself, I will visit you in Tuscany and attend your cooking classes. Thanks Juls. Great blog, Juls! 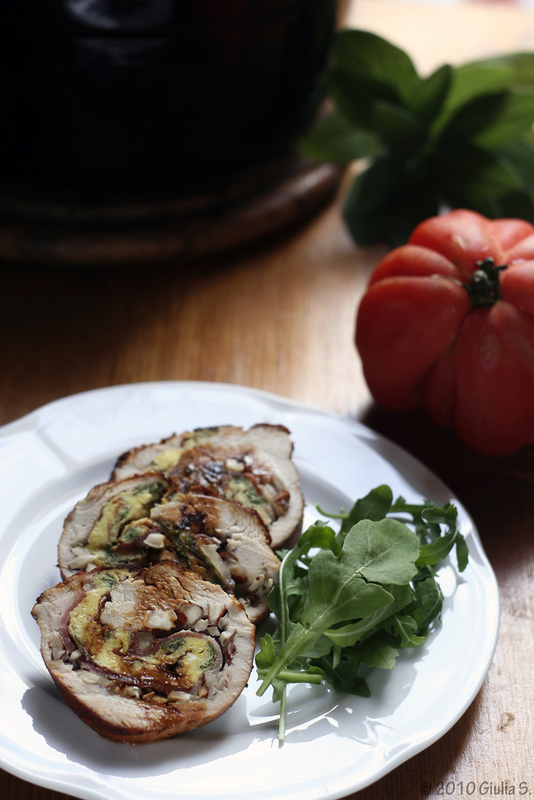 Love your recipes; simple, honest food, like almost everywhere in Italy.